The Brexit process has thrown British politics into crisis in a way rarely seen before. The failure of Prime Minister Theresa May’s Brexit deal means there is still no resolution in sight. Parliament rejected the deal May negotiated with the EU by a mammoth 230 votes, the largest defeat for a government in the history of the British House of Commons. Since then May has refused either to contemplate serious changes to her proposal for Brexit or secure significant new concessions from the EU. Yet May continues to survive as Prime Minister because the Tories, and her allies in the Democratic Unionist Party, still back her. A no-confidence motion brought forward by Jeremy Corbyn’s Labor Party lost by 325 to 306 votes. As it stands, Britain is scheduled to leave the European Union with or without a deal by 23 March. This raises the prospect of a chaotic “no deal” Brexit where Britain would exit without any agreement on trade terms with Europe. Business is desperate to avoid this. The Tories are fundamentally divided over what kind of Brexit they want. And there is a big unresolved question over Northern Ireland, which the Tories want to take out of the EU trade zone without re-imposing a “hard border” with the Republic of Ireland. May wants to maintain as much access to the European market for the banks and big business as possible. But this means accepting at least some EU trade rules, which is opposed by “hard Brexit” Tories who want Britain to be free to pursue its own trade agreements. There is a longstanding division in the Tories over the EU. Big business sees the European market as central to expanding their profits. But the “hard Brexit” Tories claim Britain would be better off operating independently to build trade relationships across the globe. This is based on the fantasy that Britain can again be a global power as in the days of the British Empire. But the popular appeal of racist nationalism has given it a new lease on life. Many in the Labour Party and the left want a second referendum to try and overturn the Brexit vote. But this is a mistaken strategy. It pits the left against the majority of people who voted against the EU, including a third of Labour voters. Refusing to accept the outcome will only drive Leave voters into the arms of the right. Whilst many support remaining in the EU in defence of open borders in Europe, the EU itself is no anti-racist institution and does not guarantee freedom of movement. After three months, EU citizens living in another EU country must meet certain criteria in order to stay. They must be in work, be seeking work with a genuine chance of getting it, be able to prove they aren’t a “burden” on public funds and have health insurance. The EU doesn’t protect migrants or refugees. In 2008 the European Parliament adopted a new law that aimed to fast track mass deportations. It removed migrants’ rights to legal representation and allowed states to deport unaccompanied children. Fortress Europe means refugees fleeing war and poverty drown in the sea. The EU is a deeply neo-liberal institution. A founding treaty “prohibited” all restrictions on bosses’ ability to make profits. The EU was designed to boost the profits of business. It has facilitated the neo-liberal process whereby governments have abdicated responsibility for social services and privatised services to the benefit of corporations. The 2007 Lisbon treaty enshrined the privatisation of public services in the EU. It committed member states to have balanced budgets and near-zero structural deficits. The institutions of the EU are even more remote from pressure from below than national governments, and the key decision-making bodies are unelected—such as the European Commission, the Central Bank and the President. The Tory government is in a deep crisis. The left must put forward an alternative to an undemocratic second referendum or the false choices of a soft or hard Brexit. Pressing issues like funding for the National Health Service, job losses in the car industry and the rights of migrant workers in the UK could mobilise workers into a campaign that fights for nationalisation, workers’ rights and for free movement of people. Such demands require breaking from the EU and its neo-liberal strait-jacket. 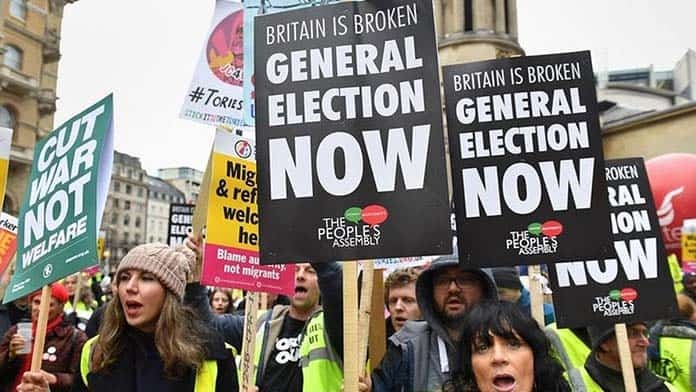 Whilst Corbyn moving no-confidence motions in parliament helps demonstrate the weakness of the May government, a movement on the streets and in the unions is needed to push the weak Tory government out.